Deliciously rich and creamy, this heavy-duty mayonnaise is the perfect ingredient or stand-alone condiment for all of your most popular recipes. Perfect for a wide variety of tried-and-true recipes, from creamy tuna salad to decadent pasta sauce, this heavy duty mayonnaise is the perfect condiment for any kitchen. Rich in taste and creamy in texture, it easily enhances countless dishes and pairs well with spices and herbs for easy, extra bold sauces or spreads. It's even packaged in a 1 gallon container for bulk use applications. "Mayonnaise gallon is great because we don't have to restock as often. Good quality supply especially for fast paced environment. The container is very sturdy, we don't have to worry about leaks." 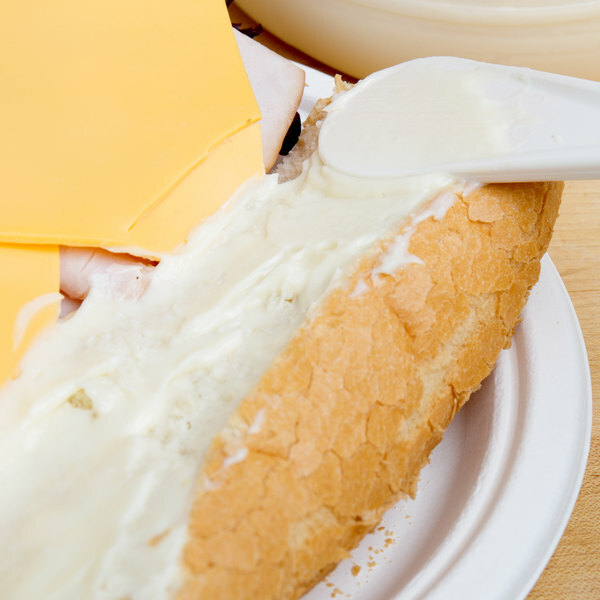 Let the mayonnaise soak into breads and create hearty, flavorful sandwiches or mix it into tossed salads. To spice things up, add it to your own blend of herbs, spices, and ingredients to create new signature zesty sauces great for drizzling over crab cakes or burgers! 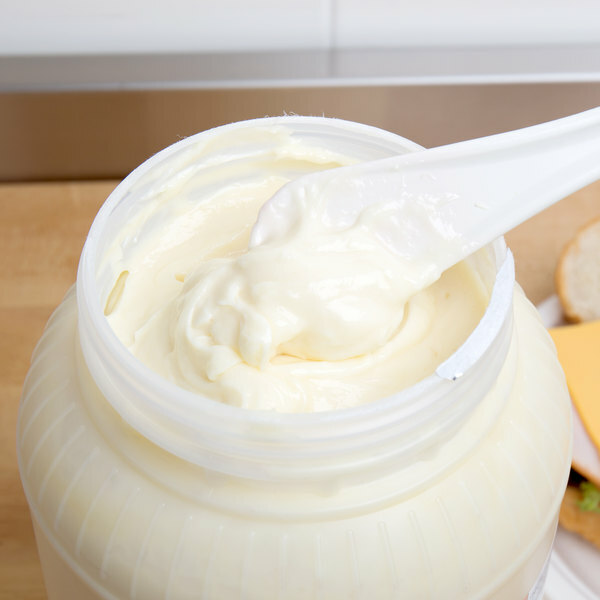 This premium mayonnaise delivers the best flavor and stability, with excellent holding power in all hot and cold applications. 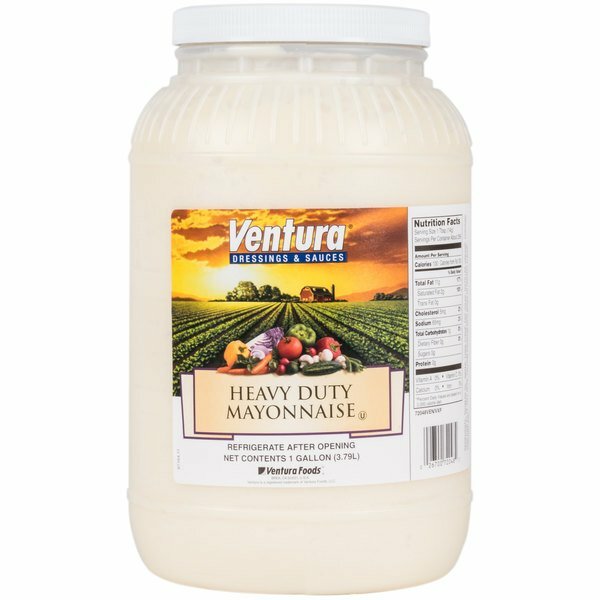 Exceptionally thick and creamy, this heavy duty mayonnaise is never watery or thin-it makes the perfect potato salads, chicken salads, and tuna salads! With its classic recipe, this creamy, mild mayonnaise features a rich and slightly tangy taste. These tangy undertones are sweetened to create the perfect blend of flavors. You're constantly on the move, serving customers and whipping up orders in the back-of-house. This mayonnaise comes in a bulk, 1 gallon container that's perfect for high-volume use. It also features a resealable, twist-on lid that simplifies product storage. This is a great flavored mayonnaise. 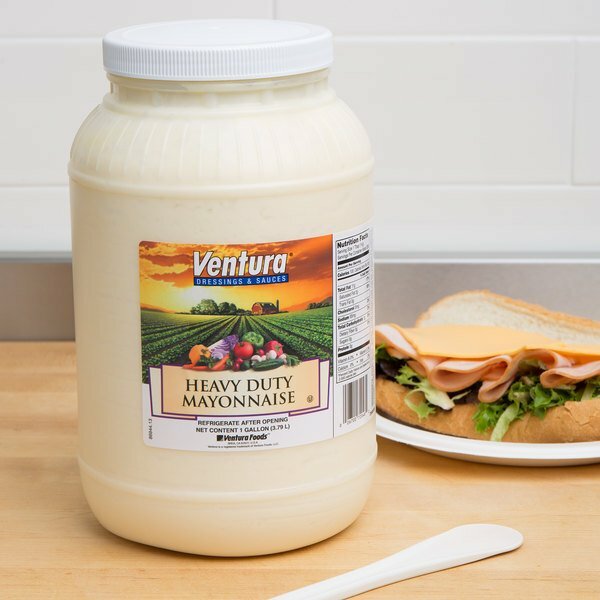 The large gallon size makes it easy to make large quantities of potato salad, macaroni salad, tartar sauce and a wide variety of dressings that are sure to please everyone. Mayonnaise gallon is great because we don't have to restock as often. Good quality supply especially for fast paced environment. The container is very sturdy, we don't have to worry about leaks. 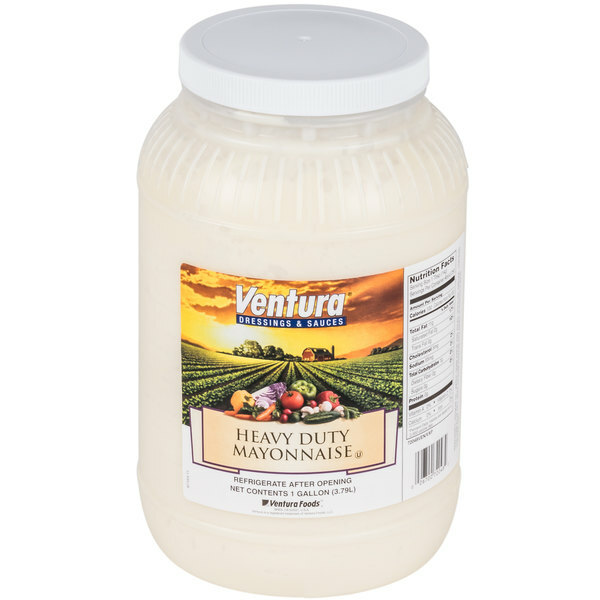 A great bulk size container of heavy duty mayonnaise with a great taste. The mayonnaise is great for making our chicken salad and is priced well. This is a great, creamy mayo. It’s got a nice rich flavor to it, and we use it for everything- simply topping burgers or sandwiches, pasta salads, and ranch! This mayo tastes great and at a good price as well. We have it on hand for sandwiches, salads and sauces. And it is Very economical. DID NOT LIKE THE MAYO AS IT WAS NOT AS HEAVY DUTY AS WE WANTED IT TO BE, BUT THEIR OTHER PRODUCTS ARE ABSOLUTELY GREAT. Thank you for your feedback! We are sorry you did not prefer this mayonnaise. For recommendations, please contact our Customer Solutions team! I like this brand of mayo for salad dressings and aiolis. It is a little bit thicker than store bought brands. It tastes great in everything. Not the best mayonnaise I have every tasted, but it is still good mixed into things like chicken salad. The mayo is thick and lacks the flavor of some more higher priced brands. A great priced mayonnaise in a sturdy gallon jar. It has a great texture and flavor. It is perfect for mixing into our chicken salad and tuna salads. This is a great price for mayonnaise. As a restaurant, we go through a LOT of mayonnaise and the price is definitely right. We will be buying from here from now on. This is heavy duty. Not the best tasting but not terrible. I think I would go for helman's next time. But its good for the price. This mayo tastes great and at a good price as well. Not quite as good as Duke's but much cheaper. Just as good as what we had been getting from Sam's. I contacted a store where I purchased sandwiches to inquire about the mayonnaise they use because it is so wonderful tasting. 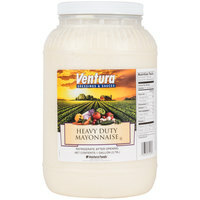 I learned online that I was able to order the Ventura Foods Heavy Duty Mayonnaise through Webrestaurantstore.com I was thrilled. The shipping was a little expensive because the container is large but it is very well worth it. The mayonnaise is like nothing I have ever tasted and the price is great. I believe if you have a restaurant, you should consider this product for your customer's enjoyment. This was delicious mayonnaise, and I can be picky. I made potato salad with it and everyone gave it rave reviews. Will purchase it again. Great tasting heavy duty mayonnaise in. Great quantity discount and will last us a long time. Customers love this product. We will continue to buy. Pleasantly surprised how good this tastes in comparison of the higher priced alternative(s). When you use it for various salads, I would recommend saving the money by opting for this product. Your customers will not know any different. We were looking for a heavy duty mayo for our subs. I have to admit, this was a quality product comparable to brand name options at a much lower price. In the end however, the reason for the lower rating was the overall cost with shipping. After some comparison, we were able to buy another off-brand heavy duty mayo at a local discount food store for pretty much the same price (after shipping) which actually tasted a little better in our opinion. So it's just easier to grab one at the store. I guess if you were buying this in builk instead of one every month or two it might be a better deal. This mayo is perfect for making ranch dressing or coleslaw dressing. It is very thick and heavy, so it holds up well. However, I experienced an issue with packaging. It is possible that it was dropped causing the seal on the jar to break, but not the outer seal, indicating that it had not been opened/damaged. Put it on the shelf for a few weeks until it was needed only to find it spoiled an separated because the inner seal was broken. Thanks for the review, Jacob! We're sorry this was damaged. Our Customer Solutions team was happy to assist in crediting you for the spoiled mayo. Very good flavor! It came well packaged and tasted great! The price was great compared to some other name brands, but the flavor is very similar! 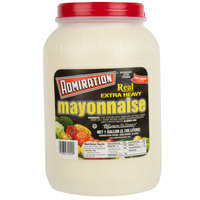 Oh My Goosh, we were always running out of mayonnaise when we needed it, I bought this 1 gallon from Web. and you can not tell the difference from any other brand.Great taste also. This mayonnaise is creamy, rich, and has a great flavor. The price point is so much better than others, but it does not compromise the quality and the great taste of this product. What great flavor!!! The price makes it even more appealing. We did a taste testing with another major brand and found minimal difference but the price differential far out ways any difference in taste. Very good quality item! I Have used this mayo for over a year in my restaurant, and could not be happier! Will continue to order! Very good mayo. I will be buying again. For the price listed it is worth it. We use this mayo for a lot of our cold salads. A great value for Mayonnaise. Tastes great just like the more expensive name brand mayonnaises. Perfect for food service stands and church dinners with lots of people. wow this is an amazing mayo. the price had me worried, but I had no problems once I tried it. what a great value with 4 gallons in a case. A great tasting product with many applications. US Foods, Sysco, Maines will sell you the same product for more per case. Thanks to webstaurant store for helping our bottom line. This mayonnaise is our go to item for making flavored dressings for sandwiches. We use it to make our Chipotle Mayo and Sriracha Mayo dressings for our turkey club sandwich. This is a great product for all of our mayo based salads, such as pasta or potato. It has a great mayo flavor and is very thick and sticks to the product, it will not get watery. We used this mayonnaise in order to make tuna salad, chicken salad, and also lobster salad at the place I worked this summer! It's really versatile. This is a perfect size for easy storage in the fridge. 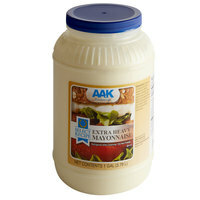 I use this mayonnaise for mixing up tuna and chicken salad for serving, it is great. This mayonnaise is good for making homemade chicken or tuna salad! Excellent for potato salad and even for making dressings; crab cake dressing or lobster roll dressing!! Awesome deal, the taste is as good as comparable brands, the gallon size makes it an economical steal for restaurants. Shipping is fairly reasonable considering the weight. I use this brand also myself for many different sauces. My remolaude sauce is based with this. At this price here you cant even think about using something else. Great product, great price. I use this mayonnaise for a lot of different things but I mostly use it for tuna salads, chicken salads and on subway sandwiches. Most people do not believe me that I did not used Hellman's or Kraft mayo, and when I tell them that I used Admiration brand of mayo they are just surprised to find out that it tastes so good. And the value is unbeatable: 2 times less than what you will find at Costco.